How sad that Washington and the media will never understand; it’s about country. And though it’s honorable for countless others to leave their positions for a higher calling and without finishing a term, of course we know by now, for some reason a different standard applies for the decisions I make. Um, what higher calling are we talking about here, Sarah? Freeing up your schedule to whine more regularly on your Facebook page? But here’s an interesting thought: Maybe she really means this. Seriously. Maybe she really doesn’t get the difference between resigning your office to, say, accept a nomination as Secretary of State or ambassador to China, and resigning your office just because people are mean to you and the whole governor thing has gotten kind of boring. 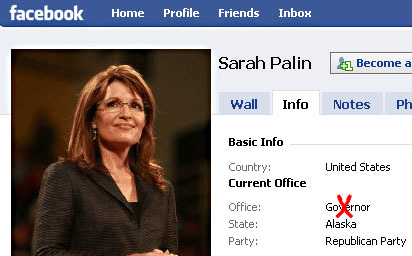 This is Sarah Palin we’re talking about, after all.